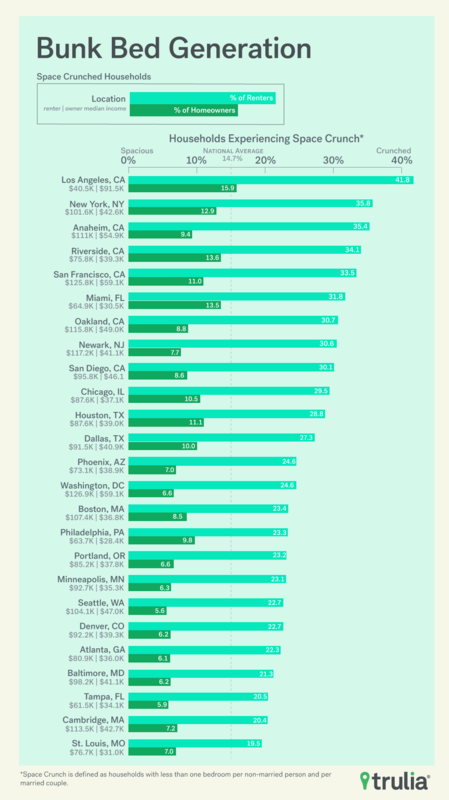 Using cost-of-living data curated by CareerTrends, Graphiq ranked the most affordable and most expensive large metro areas in the nation for two-children families in two separate lists. Ranking no. 5 on the affordable list, Houston-Baytown-Sugar Land wasn’t the only Texas community to rank as one of the most affordable large metros. Dallas ranked no. 7 on the list, and San Antonio ranked even more affordable than Houston, at no. 3 on the list. To help determine which metros are most likely for homebuyers and renters to bunk up in a room, Trulia released a new report, titled the “Bunk Bed Generation.” Ranking just below Chicago is Houston and Dallas. According to the report, 11.1 percent of Houston residents have to share a tight space, and 28.8 percent of renters are in a tight squeeze.